The Boy Scouts of America, acting through the National Court of Honor, may award the Silver Beaver Award for distinguished service to youth. The award is made for noteworthy service of exceptional character to youth by registered Cub Scouters, Scouters, Varsity Scouters, and Venturing leaders within the territory under the jurisdiction of a local council. 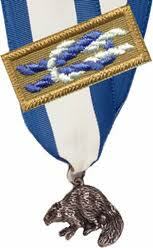 Anyone my nominate any deserving registered Scouter to the council, which selects recipients for the following year.